CHENNAI, India--(BUSINESS WIRE)--School students from across the country recently received the chance to compete in the Spark Junior Quiz (SJQ) 2018, one of the foremost math, science and technology quiz competitions in India. SJQ 2018 allowed over 2,000 school students the opportunity to take part in one of India’s best school level quiz. The quizzing event was conducted in 18 cities across India and the finals saw the best competing at IIT Madras. Organized and conducted by the students of IIT Madras for Shaastra, their annual tech-fest, and proudly sponsored by MySchoolPage, an online EdTech startup that offers online tutoring for students in K-12 in various fields, Spark 2018 was a resounding success. According to the Co-founder of MySchoolPage, Dana Jandhyala, "MySchoolPage aims to unlock the true potential of school students by getting them interested and engaged in their learning. The Spark Junior Quiz (by Shaastra, IIT Madras), is an attempt to get school students interested in the world of Science, Technology & Innovation, which is critical for inspiring students to aspire for a bright tech-future. We, at MySchoolPage, strongly relate to the goal of IIT Madras and so we were delighted to get involved in this effort." Venkat Phanikiran, COO of MySchoolPage, an IIT Delhi alumnus, was invited to address the school students visiting the IIT Madras campus during Shaastra. He spoke to students on Career Guidance, factors affecting their Academic Success, and a sampling of available career choices in post-secondary education. To accommodate all the eager students, he took multiple sessions. MySchoolPage is a global education startup headquartered in Boston, Massachusetts, USA with offices in Dubai, UAE and Bangalore, India. The company provides a wide range of on-demand online tutoring services for K-12 students in 5 continents, and has conducted over 50,000 sessions to date. With a rigorous process of curation, selection and certification for each tutor, and programs designed to address various academic needs, MySchoolPage has already been recognized by the Silicon India Startup City Magazine as among the top 10 startups in the education space for 2017. 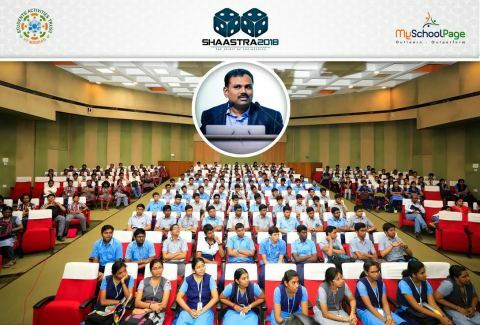 MySchoolPage collaborates with Shaastra - IIT Madras Tech-Fest, for Spark Junior Quiz 2018.